iWed Monster Wedding Cupcakes, a photo by Doha Sam on Flickr. Mamiya M645 Pro with Fuji Pro 160C negative film. This is one of the best negative films I've had the pleasure to work with. This shot is lit mainly by light bounced from a bunch of incandescant bulbs in the light fixture you can see at the back. 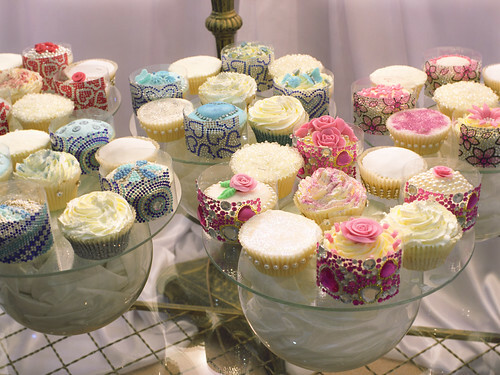 I held a large white card over the fixture to bounce the light onto the cupcakes. There is also all kinds of other weird light sources because it is in a big hall. I don't normally plan on scanning medium format images at 4000dpi because it is overkill. 360MB TIFF, anyone? But if anyone wants to see why the Coolscan 9000 ED is such a great machine feel free to click the "Original Size" link. I had to reduce the JPEG quality to 80 to squeek under Flickr's 20MB cap on image sizes! The final image size is 54 megapixel after cropping. These were taken at my wife and daughter's stand for their business "Cupcakes" which is opening its first shop as we speak!